Did the Titan II accident spur some transparency? According to a Department of Defense report, there have been at least 32 “accidents involving nuclear weapons.” And the report only counts US accidents which occurred before 1980. “Narrative Summaries of Accidents Involving U.S. Nuclear Weapons” briefly recounts each of these incidents. They include such gaffes as nuclear bombs inadvertently falling through bomb bay doors; the accidental firing of a retrorocket on an ICBM; a bomber crash involving the vast dispersal of radioactive debris; and the loss of fissile material and nuclear bombs (which are “still out there somewhere”). Mark 6 nuclear bomb similar to the one the United States Air Force inadvertently dropped on the Gregg family’s garden in Mars Bluff, South Carolina. These “nuclear accidents” –which the report defines as “unexpected event[s] involving nuclear weapons or nuclear weapons components”– have occurred over the Pacific Ocean (twice), over the Atlantic Ocean (twice), and over the Mediterranean Sea; they’ve happened on the territory of our allies in Spain, Greenland, England, Morocco, and another undetermined overseas base; and in the states of Arkansas, California (twice), South Carolina, North Carolina, Florida, Georgia, Indiana, Kentucky, Louisiana (twice), Maryland, New Jersey, New Mexico (twice), Ohio (twice), South Dakota, Texas (twice), and Washington. Some of these accidents were disclosed for the first time only in this report. The DOD explained that these nuclear accidents “may or may not [have been] divulged at the time depending upon the possibility of public hazard or alarm.” Trust me, if I had lived at any of the above locations, I would have preferred that the government “divulge” the fact that a nuclear accident had occurred. 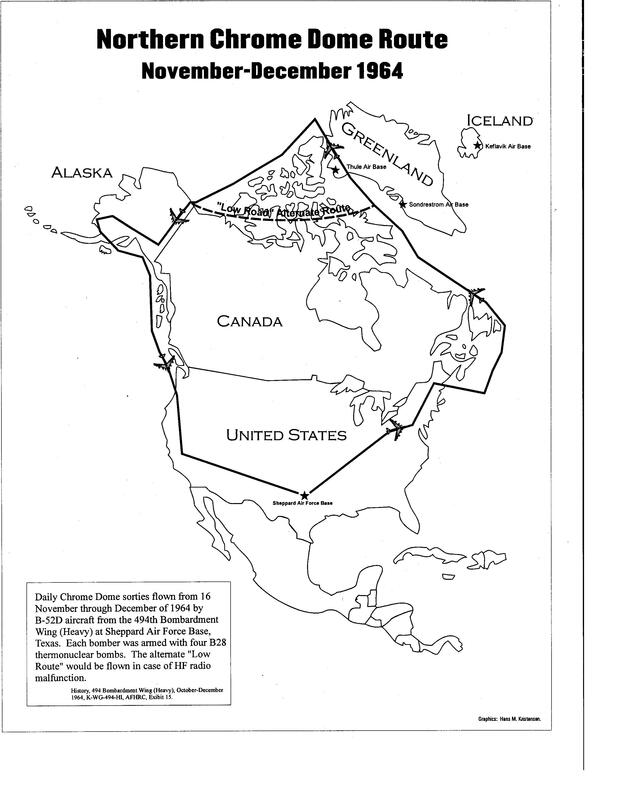 Map of B-52 route flown during Operation Chrome Dome, a facet of Airborne Alert. According to the DOD’s preface, most of these accidents occurred during “logistic/ferry missions or Airborne Alert flights by Strategic Air Command aircraft.” Airborne Alert was a program in which US nuclear-armed bombers loitered in airspace outside the Soviet Union to ensure that the US could hit the Soviets with a nuclear strike at any time. Airborne Alert was finally terminated in 1968 due to the implementation of ballistic missiles, rising costs, and –not least of all– nuclear accidents, most notably Thule.. 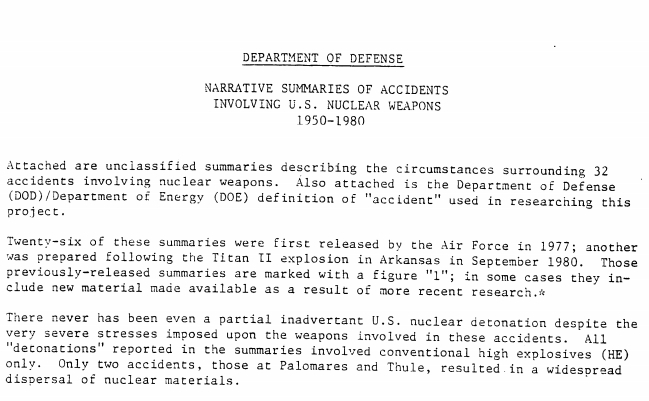 This DOD report proudly notes, that “There never has been even a partial inadvertent U.S. nuclear detonation despite the very severe stresses imposed upon the weapons involved in these accidents.” Very fortunate. At the time of most of these accidents, the primary safeguard against inadvertent detonations was the separate storage of highly enriched fissile material apart from the nuclear bombs themselves. The fissile material had to be manually inserted into the bombs to arm them. Still, there were several accidents where these “nuclear capsules” were either lost or caused the dispersal of substantial amounts of radiation. Although, there were no accidental nuclear explosions, the bombs’ high explosives (a necessary component in nuclear weapons) have detonated several times causing devastation and death. In 1957 a nuclear bomb fell through the bomb bay doors of a B-36 bomber near Kirkland Air Force Base, New Mexico. The bomb fell 1,700 feet to the ground and its high explosives detonated, showering fragments as far as one mile from the impact point. 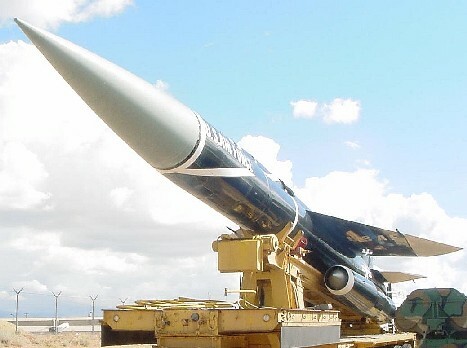 A BOMARC A air defense missile. In 1966 a B-52 carrying four nuclear weapons crashed into a KC-135 aircraft over Palomares, Spain. Two of the bombs did not explode and were eventually recovered after a search described as “the most expensive, intensive, harrowing and feverish underwater search for a man-made object in world history.” Two of the bombs’ high explosive material exploded on impact with the ground. The explosion –though conventional– released substantial amounts of radioactive materials. 1400 tons of soil and vegetation were eventually removed and transported to the United States. 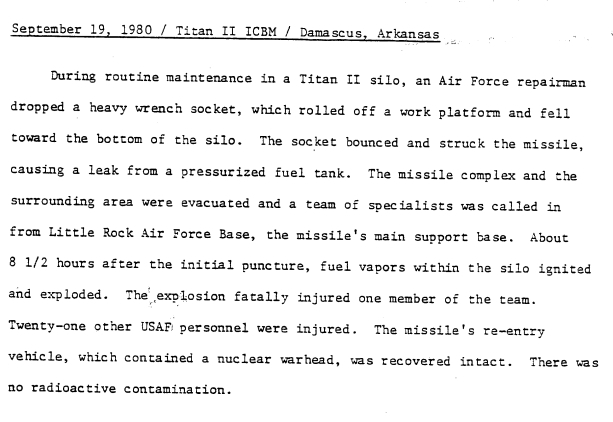 And here is the report’s description of the Titan II accident Schlosser’s account is centered upon. ← The Must Read 2013 Secrecy Report is Out. For what its worth, the infinitely reliable Wikipedia makes me think that last accident, at Palomares, Spain is the one that took off Navy diver Carl Brashear’s leg. The guy’s life was made into a movie with Cuba Gooding Jr and Robert DeNiro. Remarks: The airplane was participating in an Operational Readiness Inspection (ORI) mission. Prior to the first scheduled air refueling the aileron power control hydraulic system pressure began to drop. The emergency pump restored pressure to normal and the flight continued for an additional 5 hours. Shortly thereafter the main hydraulic system experienced total failure, and aileron power control circuit breakers popped. About 10 minutes later the airplane entered a shallow right bank. The aircraft commander (AC) disengaged the autopilot but, even with the help of the copilot, could not stop the bank from increasing. At 60-70º of bank the AC ordered the crew to eject. The airplane crashed near Sea Gull Lake, 50 miles northeast of Port Arthur, Ontario, Canada. Only the AC survived; the three other crew members perished. Investigation determined the primary cause of the accident to be a locked aileron power control shuttle valve. An 8 November 1956, TOP SECRET letter requested permission from the Canadian government for 72 B-47s to operate in Canadian airspace on 29-30 November as part of Operation ROADBLOCK, an “XYZ mission” associated with carrying nuclear weapons or components during an ORI. Half of these airplanes were so equipped. Though official records make no reference to weapons on board B-47E 52-3360, a 91st SRW RB-47 AC who located the crash site reported he was told to find the remains of the aircraft and the weapons on board. “Ten Die In B-52 Crash; 3d of Type To Fall This Year—B-47 Feared Down,” NYT, 1 Dec 56, 42. “Weather Halts Ontario Hunt,” NYT, 3 Dec 56, 19. The critique of the deterrent effect of nuclear weapons in the last para is hard to fathom. Do horns, muscles, youth and strength make the world safer for a water buffalo? From lions, absolutely. From lightening strikes, no. I wasn’t critiquing deterrence, per se. I was arguing that the laws of probability dictate that the more nuclear weapons there are, the more likely a nuclear accident will occur. Therefore, it is in mankind’s interest to have fewer nuclear weapons. I would have taken this posting more seriously if you had avoided all the innuendo sprinkled throughout. The material speaks for itself, if only you’d step out of the way. I stopped reading at ” How fortunate.” (fourth paragraph) referring to the DOD’s comment on their safety record. The safety systems performed as designed and were adequate. Like a nuclear blast, the bias in this article is overwhelming. of course its biased, hes using the exact words of the reports, so the military is going to say things as PC and cautious as possible. Possibly the saftey note was intended to say that in the event of a fire a nuclear weapon is designed to disabld the explosive element to prevent a full fission reaction. The scary part is, if these are our mistakes, think of how many undocumented mistakes other countries (*cough* the former USSR) has had. Nate, I am sorry, but the last paragraph of your article, just as your last comment, have absolutely nothing to do with the rest of the article, and is nothing more than bias and browbeating of a political agenda into an otherwise informative article, and disappointing, in not unexpected. The article was focused on a report from DoD detailing “accidents” involving nuclear weapons. This article had nothing to do with nuclear policy, strategic arms policy, DoD policy, or anything else construed with the whole “good vs. bad” argument over nuclear arms. It had to do with the DoD reporting out on accidents. Accidents happen, every day, so if anything this article should help showcase the extreme safeguards placed within the nuclear devices to prevent an unintended nuclear reaction. The article details at least 32 “accidents” prior to 1980, which inherently means that these devices were crude, by today’s standards, and if anything, the direct summary and conclusions from this article should be that the DoD’s extreme caution with fail-safes and security measures to prevent an unintended nuclear reaction should be lauded. Another direct conclusion is that the DoD has pursued recovery of these devices quite thoroughly. There is certainly something to be said about the lack of direct reporting about the issues at the time, but if you are old enough to remember the state of the world in pre-1980, you would understand that the government worked that way then, whether it was good or ill, that’s the way things worked in that time. Things like that were covered up as a matter of government policy, and that’s the way it was, end of story. The Freedom of Information Act didn’t exist, and the Cold War was in full effect, so trying to bash the US Government for covering up these events in the 60’s and 70’s is pure naivety. Your final 2 sentences of this article have absolutely nothing to do with the content of the rest of your report, and it saddens me to see another reporter taking factual reporting, and using it as a soap-box to preach and bash their political and social views onto the rest of the world. Try writing an honest, unbiased, and bias-neutral article, and see how you feel about yourself afterward, I think you might find it refreshing. First, the Freedom of Information act was signed into law in 1966. So it has been around for a while. Your argument that I need to “understand that the government worked that way… and thats how it was, end of story.” doesn’t quite work for me. And finally, ***I never even mentioned the theory of nuclear deterrence in my last paragraph*** The last two sentences have quite a bit to do with the report, imo. They reiterate that along with the other dangers of nuclear weapons, the public has to keep in mind one more that is very infrequently brought up– nuclear accidents. Again, even if you didn’t like my analysis, I hope you at least enjoyed the DOD report. What a charming world you live in. However, in the real world, where satellites and seismographs are used to constantly look for nuclear events, accidents most certainly do have something “to do with nuclear policy, strategic arms policy, DoD policy, or anything else construed with the whole “good vs. bad” argument over nuclear arms.” An accidental nuclear explosion, especially considering how it would take out the communication structure for miles around, could be misconstrued as an attack by the enemy. This means that the safety of the planet depends on the failsafes in each and every nuclear weapon. The accident rate better have a part of the policy discussions or they wouldn’t have been doing their jobs right. @ Shay and @Paul, its ok you don’t like my “innuendos” and “writing style;” sadly, as hard as I try, its very difficult for me to take the snark out. 🙂 At least I hope you enjoyed the actual DOD document. And to be clear, the military’s nuclear safety record is poor. If you read through the accidents, they caused millions (billions?) of dollars of damage, unacceptable nuclear contamination, and more than a handful of deaths. The comment, “the safety systems preformed as designed” is just not true. Still, thx for the comments. Of course they caused millions of dollars worth of damage. What’s the going rate for a B-52 nowadays? $50 million or so? Each bomb probably costs a few million. The search and recovery efforts probably cost several million more, each. This argument is mute – a single civilian 737 crash costs millions of dollars and takes more lives than all of the nuclear accidents combined. I have to disagree with your opinion that the military’s handling of nuclear weapons has been poor. Yes, there have been accidents, but how many of those accidents were the direct result of the nuclear weapons failing? It is a fortunate act that nuclear weapons designed and built in the United States require human involvement and that no one person can pull the trigger. Most of the failures have been due to their carrying equipment failing. That’s a case for making the delivery platforms safer (and hence the move to ICBM’s). The nuclear weapons have failed as they are supposed to. If a MOAB falls off of a B-52 and lands beside someone’s house, or in the middle of a city, there’s going to be a LOT more damage than the explosives inside a nuclear weapon. I’m not sure that your reasons for your innuendo in the article stands up to the facts. There were/are thousands of nuclear weapons in multiple stockpiles around the world, primed and ready to go at a moment’s notice, and to this day (over 50 years), there has never been an accidental detonation of the nuclear warhead. That is pretty safe. You cannot say the same about conventional weapons (missiles, guns, etc), cars, airplanes, spacecraft, coal mining, or any other large endeavor. I agree with the opinion that the nuclear stockpiles need to be diminished, but I don’t agree with your accusation that they are unsafe. Actually it is. These safety systems exist to prevent accidental detonation of the nuclear device. Not accidental detonation of the high explosive yield. The latter leaves a create the size of a large house, and behaves like a dirty bomb. The former a crater the size of a large city, and irradiates a very large area. This is an interesting read, but the shock factor is entirely due to the fact that the author neglects to explain that to detonate a nuclear warhead you need to simultaneously detonate multiple charges placed around the warhead with unimaginable precision, and fire them simultaneously with an unimaginably small margin of error. Uranium is not ‘combustible’, it resembles a chunk of carbon. So, regardless of whether or not you put the words “The atomic warhead apparently dropped into the molten mass that was left of the missile” in bold font, there was still absolutely no risk of detonation. @ Marc. Fair point. Follow the links for a fuller discussion on the plausibility of the warheads actually exploding (very very low for most). Still the visual of a 47 foot missile melting into a puddle of molten metal is pretty jarring, no? Wish it was on youtube. I’m not sure you that actually did get my “point”. I was actually suggesting that we should use logic and reason to assess the risk-factor of these scenarios, instead of imagining ‘jarring visuals’. It is insulting that you are suggesting I should disregard my understanding of this subject matter in order to appreciate your article. Marc, there are many ways in which a nuclear reaction can occur. The earliest methods of causing a super criticality detonation of the fissile material, in a bomb design, was to force a rod of, say U235, into a cap of U238. Hence, the insertion of the nuclear material as mentioned above. Your assertion that there has to be precise detonation of explosives around the fissile material has more to do with trying to get the optimum detonation and energy release from the bomb by timing the extent and rate of fission (or fusion with hydrogen derivitives). There was a chance that it may have gone super critical and detonated, depending on the safety mechanisms involved and more importantly, the design of the weapon. Yes, uranium is not combustable but then again, just like mercury, don’t try ingesting it. The main risks in the case of the missile were explosion due to TNT and gassification of radioactive material. Just like Chernobyl, you can handle uranium with no protection (albeit very briefly) with no side effects due to its radioactive properties, but if ingested then you’re in trouble. This is why radon is dangerous. Its daughter elements have a long half life and are difficult to remove from the body. Yes, I am a nuclear physicist. From the article it seems that only 1 bomb was really close to nuclear detonation of 24 megatons, having 5 of 6 safety devices fail. However, the other accidents resulted in death from conventional explosions, and an unaccounted death toll from the ‘dirty bombs’ they eventually became. Yes the nuclear detonation was avoided but plutonium, tritium, uranium that went airborne may have resulted in long term health (cancer) problems for many. The non-disclosure likely meant people dealing with cancer at stages too late to deal with given the medical technology of the era. The moral to the story is that just because its the government running something does not in any way mean that it is run well. Just about any government run operation is highly inefficient with morons under employment. Everyone knows this if they’ve ever had to stand in line for licensing, DMV issues or just about anything they operate. The fact that they now run the banks and are going to be running medical insurance should scare the hell out of you too. @ Joe. I think this is the first one mentioned in the report. But that article gives quite a few more details. Thx! Although the official story has the bomb being jettisoned in the Pacific Ocean, local legends tell of higher-than-normal radiation levels in the streams and rivers of the area (levels which puzzled environmental surveyors until the 1990s when the ‘truth’ came out). Fun conspiracy theories abound, but at the very least it gave us something to talk about in rural coffee shops for a few years! >absolutely no risk of detonation. So you utterly miss the point. Fissile material is deadly whether exploded in a fission or fusion reaction or lofted in fumes from a fire. It takes very little radiation to induce many illnesses, and it is calculated that 1 gram of Pu is enough to poison the whole world’s population if properly delivered. Go see how much Pu Rocky Flats put up the smokestack over all those years (http://www.racteam.com/docs/Rocky_Flats_Routine_Plutonium_Releases_Source_Term.pdf). Radiation release is just as deadly as a nuclear detonation, and has happened far more frequently. 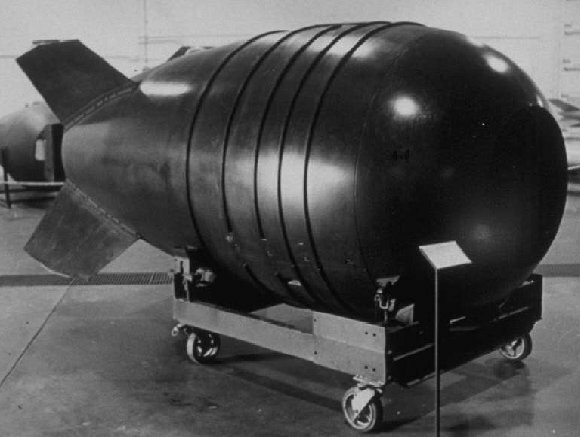 Anti-terrorist organizations are almost paralyzed with fear about a “dirty” bomb: MUCH easier than an actual nuclear bomb once you get the radioactive stuff and deadly over a wide area. Not as impressive as the Tzar Bomba, but effective. Cold-war game theory notwithstanding, both the USSR and the USA dumped radionuclides all over themselves (Hanford, WA; Rocky Flats, CO; Ozersk in Russia and on and on). That didn’t make us safer, and if you think it did, go buy a house downwind of the old Rocky Flats or Hanford facilities. Did the bombs and Mutual Assured Destruction/Maximum Flexible Response keep us from killing each other? Maybe, maybe not: it depends on just how crazy you think the Soviet leaders were (they knew our military could kick theirs and that their economy could not withstand a long war or drawn-out occupation of Western Europe; that was the alleged logic behind Reagan’s speed-up of the arms race, to break them financially). Until the 1980s the US had an almost 3 to 1 lead in warheads and much better delivery systems: however much they built, the Soviets knew there was no winning that “war”, so why start it? But we sure as hell poisoned ourselves: read up on how everybody has Strontium 90 in their teeth now (one source: http://www.usatoday.com/money/industries/energy/2004-01-02-babyteeth_x.htm) or about radioactive ants, mice, and tumbleweeds at Hanford, WA (http://www.commondreams.org/headlines03/0815-08.htm). Fred mertz whines about the piddly nucleotides released by defense programs while ignoring the thousands of tons per year put out by coal powered plants: http://www.scientificamerican.com/article.cfm?id=coal-ash-is-more-radioactive-than-nuclear-waste. Emissions by your average coal plant approach those of those of rocky flats at it’s worst. Now multiply that by the thousands of coal plants that continue to do so unminded by twits who read “nuclear” as “automatically bad”. Fred also glosses over nutcases like Castro who didn’t care whether or not anyone lived after a nuclear exchange. Your post-facto certitudethat “of course nobody would have started a war” has nothing to do with the reality that some of us lived through. Kruschev was sane enough not to start a nuclear war. Hopefully Ahmadinejad will be too. You forgot the very first ‘broken arrow’…. First off, interesting article. I’d heard of some of these, but not all. Secondly, regardless of one’s views on the weapons themselves, accidents are almost never the product of a single failing. They are far more often the product of multiple failures that happen to align in such a way as to cause disaster. Such systemic failures are inevitable. No matter how good the system, they will happen. This is why there’s so much work into fault tolerance, these days, in addition to the reliability of individual components of any system. Accidents, though, will happen. Always. Whether they should be kept secret, well, that’s an interesting policy issue that I think needs closer examination. Is the secrecy from potential enemies or from the citizens? Is it beneficial or merely an exercise in face-saving? I don’t know if these questions have ever really been addressed. A correction to the Goldsboro citation: The weapons involved were 3.8 megaton devices, not 20 megaton devices. In none of the cases cited did the safety features of the weapons fail or even result in a fizzle yield detonation. As to your comments about the safety systems.. the key point is that they DO work even in cases where normal systems would fail. As to the wisdom of having nuclear weapons .. I don’t think they’re a good idea over all but Mutual Assured Destruction did allow both us and the former Soviet Union to back away from confrontation without losing face. I spent a few years writing war games for some now long gone game companies, so I’m very well versed in the background,weapons effects, etc of Cold War systems. Per the Center for Defense Information and an article in Mother Jones, the bombs at the Goldsboro incident were 24 megatons. Do you have a source saying they were 3.8? Does anyone know which of the incidents Mr Ballard of the Titantic fame was involved with in the recovery efforts? In 1983 there was nearly an accident that would have resulted in the destruction of mankind (i.e full scale nuclear exchange) – it was really very close. Time to join CND ? RE: People that think having an opinion = political agenda. I am totally FOR nuclear power, but I am totally against nuclear bombs. Mutually assured destruction? Yea, great. Nate Jones is obviously against nuclear bombs. I don’t blame him. The fact that I don’t like the thought of a 100 Megaton bomb drop being able to wipe out all of New England in one fell swoop, makes me what? That I’m trying to make some sort of statement? Okay sure. I want to live, I want my children to life. Statement made. So get off your high horse and try to put more thought into a comment except to dismiss any opposition to your own views as “political agenda.” Sounds like YOU are the one with the agenda. I would call this an editorial piece, very biased, but that doesn’t mean I don’t agree with it from top the bottom. When’s the last time someone invaded the U.S. or Canada ? I mean with guns and planes and bombs and stuff ? NEVER! We are at a greater risk of being killed by our own, than by foreign armies; why ? Because this culture of fear and violence and stress is turning normal people into basketcases. I harbor a hundred times more anger for my own government than for any other nation or social group, and that is the fundamental problem with politics today : they ignore the home land. I wonder how many other nuclear nations have had similiar incidents??? Isn’t that the whole point to remind us how flipping dangerous these weapons are? Buggered if I’d want the job of being near or cleaning up the mess of a missile meltdown that included a warhead. Or any other kind of nuclear mess for that matter. The above quoted statement is simply not accurate. The United States was invaded during the War of 1812. Depending how you view the Confederacy, Lee’s march’s north in 1862 and 1963 would also count. Canada was invaded by angry Irishmen known as the Feinians who in 1867 sought to conquer Canada and then ransom it back to the British for Irish freedom. Right before WWI, you had the raid into Columbus NM which led to the Mexican Expedition. During WWII, you had Pearl Harbor. The Japanese shelled the West Coast using subs at least once. Germans U-boats raided East Coast shipping with immunity in what was known as the “Happy Time.” At least one raid by German commandos was foiled. On 9-11 you had 9-11. Finally, let us not forget the constant warfare against Native Americans from colonial times to 1890, which while neglected by our primary school history books consumed a substantial portion of this nation’s time and wealth until they ended in 1890. I really like the one in which an advanced radar station (Iceland? Greenland?) system mistook a flight of geese for a Soviet missile strike. Nothing a providential iceberg, blocking the warning signal long enough, prevented the world from being seeped into nuclear armaggeddon in the mid-1950’s. I’ve come to believe in the Hand of God quite a bit more, since confirming that one. But there’s just no stopping some people. this cases are so unfortunate. most of them could be prevented, and why would one created the nuclear bombs at the first place? The reason was the Japanese attack on Pearl Harbor Hawaii on Dec 7th 1941 that started World War II. Also Germany invaded Europe so we had to fight both and the AXIS alliance too. The US started the Manhatten Project to develope the nuclear bombs. Germany had lots of very advanced weapons and also nuclear physists that were very talented and could have been working on a nuclear bomb too. The Japanese were also working on a nuclear program too but were very behind becasuse they had little uranium and Germany was sending them some at the end of the war. 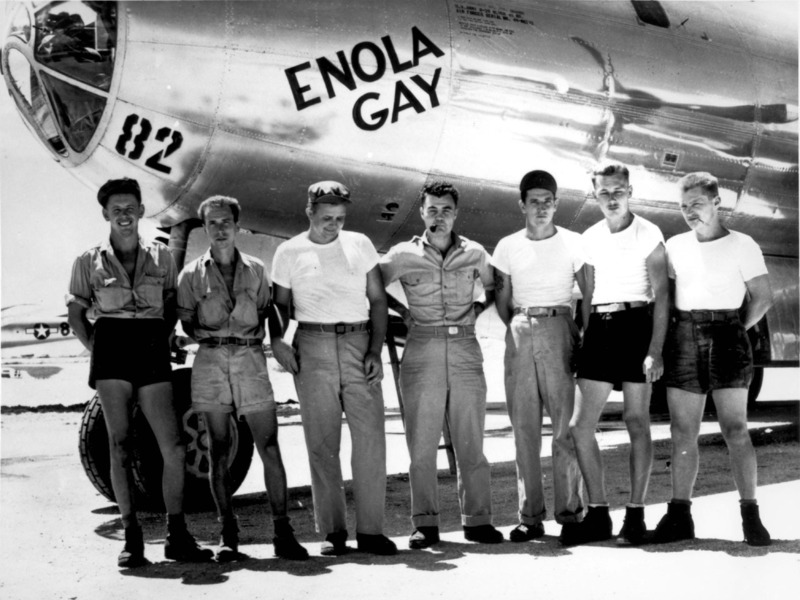 Dropping the atomic bombs on Japan shotened the war by probably 2 years and may have saved millions of Japanese and Allied lives by not invading their homeland because the Japanese surrendured very quickly after they were dropped. The other benefit was invention of nuclear reactors wich are by far the best way to gernerate base load electricity. Of course, the Japanese attack on Pearl Harbour didn’t start WW2. And, it’s been argued quite convincingly that we never had to drop the second bomb – all we had to do was wait another day or two. But, I don’t think that anyone at the time completely understood the horror of radiation and fallout. I don’t buy that we saved Japanese lives with the bombs but Japanese soldiers were the most determined and willing to fight to the bitter end. It potentially saved millions of Allied soldiers. I do believe that if Germany had been able to sustain war for a few years longer they woud have developed the bomb, but Germany was doomed as soon as the US entered the war. All of this is neither here nor there. The world would be a better place if the number of nukes is reducd as much as possible. They are just far too dangerous and horrific. I have been more unnerved by the comments than I was by the article. I guess you are all aware that there are 32 individual cards on display at the museum in Los Alamos that detail each one of these nuclear accidents. Though I found your article informative and agree with its overall conclusion, I found myself irritated by the moralizing and melodramatic tone. Trust you, you would have preferred to know if a nuclear accident occurred? I bet you would have — but isn’t that the point of your whole article, that the public has no decision-making power over these weapons? So why the housewife-style confidences? How, of all the things in this report, can you mock that sentence? Of all the misdirected sarcasm, this might be the worst case I’ve ever seen. When compared with bombs falling into mud and the release of “substantial amounts of radioactive material,” I don’t think I have to tell you that the detonation of a nuclear weapon is unimaginably more horrible — with devastation not on a mundane, but an apocalyptic level. Trust me, it is indeed fortunate that one has never detonated. Fair points. For a less moralizing (and more complete) assessment check out the CDI report I referenced. Thank you for leaving my comment up. I admit it was a little over the top. It would appear that most of the occurrences happened some years ago, hopefully it remains this way. In the meantime when places like North Korea, and Iran are attempting Nuclear capabilities, it would almost be suicide to dump ours when they are building up. What do you think? @ Bill, the reason all these accidents were years ago is because the report stopped reporting at 1980. I suspect that nuclear accidents still do happen all the time. Off the top of my head, I remember the US “accidently” shipped nukes to Taiwan a few years ago and also a bomber “accidently” flew all across the US with nukes it wasn’t supposed to be carrying. Bob Gates was pissed and some heads rolled. Still nuclear “accidents” still do happen, there’s just not a comprehensive report. But my bottom line is that the more nukes there are, the more chance of a catastrophic accident. That means I’m against proliferation (esp to Iran and N. Korea) as well as against too large of stockpiles at home. This was really interesting. Thank you for sharing. the shield to avoid the nuclear accident and consequences how much is reinforced if happened the attacks accidentally let’s say terrorists by chance hold the nuclear weapons probability fortunate moment created. how ever there are not fact of the terrorists obtain the nuclear weapons options deduced exist. how can defecting the networks of terrorist existence in let’s say like Ethiopia country possible this day? it is what in my mind a lot of time I think and undefined to me.